Fast honing diamond surface with the realigning function and convenience of a traditional butcher's steel. 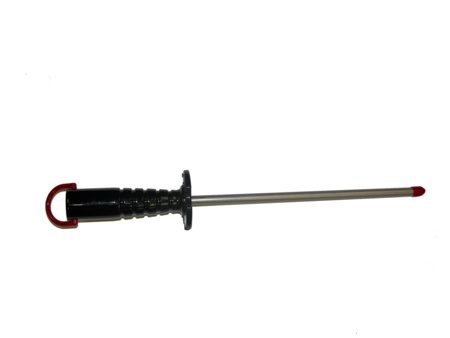 This diamond sharpening rod has a sanitary black plastic handle with large guard and a color-coded ring for easy grit designation and hang-up. Fine diamond stone (25 micron / 600 mesh) for a razor sharp edge. Rod measures 10” x .375” (254 mm x 10 mm).